25 September 2015. 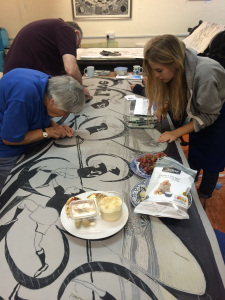 At Brighton Art Fair today, Helen Brown, workshop leader at Brighton’s Bip Art, told Art+ magazine that Bip Art members were in the process of helping to create the world’s longest lino cut print (33m long), and will complete their 3x1m section of the print on 30 September. 13 print making organisations around the UK are involved in the project, which will feature scenes from rugby. Helen said “many of the members of Bip Art are helping make this project come to life. Bip’s leader, Anna Darcy Hughes, drew the designs from a brief supplied by the Rugby World Cup organisers, and other members are helping cut the lino. We are a wide cross section of people, from seventeen year-old Evie, to Eileen, who is in her eighties. This entry was posted on September 25, 2015 by braveadmin in Uncategorized.